In the predawn sky of July 10, 2018, the moon will cross in front of the bright star Aldebaran in an occultation that won't happen again until 2033. This SkySafari map shows the location of Aldebaran and the moon during the encounter. For the past few years, the moon has been crossing paths with one of the brightest stars in the sky, causing a stellar eclipse, or occultation. On Tuesday (July 10), before sunrise, the very last of these in the current series for North Americans will take place. If the weather is clear in your area that morning, you might want to rise early and check out the east-northeast sky as a waning crescent moon has a very close encounter with the bright, orange-hued Aldebaranin the constellation Taurus, the bull. And if you happen to live in central Canada, Iowa, Minnesota, Wisconsin and the Upper Peninsula of Michigan, you'll have a chance to see the moon actually occult, or eclipse, Aldebaran. See the "footprint" of the region of visibility here, courtesy of the U.S. Naval Observatory. Not until 2023 will the moon hide a star of the first magnitude for North America (the star Antares), and not until 2033 will there be another passage of the moon in front of Aldebaran — the brightest star other than the sun that the moon can ever cover. Although two more Aldebaran occultations are due this summer (Aug. 6 and Sept. 2-3), they will not be good viewing opportunities because the zones of visibility will be quite inaccessible (Siberia, Greenland and the Arctic regions). After the Sept. 3 event, the moon's orbit will have shifted northward, thus signaling the end of the current series of Aldebaran occultations. We then must wait until Aug. 18, 2033, for the next series of Aldebaran occultations to begin. Scandinavia will be in the best position to see that first event in the new series, but Canada and the United States will not get their next chance to see the moon hide Aldebaran again until Oct. 12, 2033. The biggest drawback to watching Tuesday's event will be the very low altitude of both the moon and the star in the regions where the occultation will be visible. The waning crescent moon will be only 11 percent sunlit, so those with clear skies might see the star's reappearance from behind the moon's dark portion even without optical aid (though binoculars or a small telescope will certainly accentuate the view). But you will need an unobstructed horizon in the east-northeast, where the moon will appear to rise. The altitude will be only 3 degrees for the reappearance in Minneapolis at 3:47:54 a.m. CDT, while it will be 5 degrees up in both Duluth, Minnesota (at 3:52:06 a.m. CDT) and in Winnipeg, Manitoba, at 4:02:36 a.m. CDT. A schedule for the disappearance and reappearance in universal time of Aldebaran, for approximately 90 locations, can be accessed here. These side-by-side views show what an Aldebaran occultation by the moon is like. This image was taken by amateur astronomer Gowrishankar L., shows the moon occulting Aldebaran on March 4, 2017. The image at right has its brightness enhanced to make the star visible. The most interesting views will be along the southern limit of the occultation, where the star will flash off and on as it is covered by the large mountains near the lunar south pole. According to David Dunham of the International Occultation Timingers Association (IOTA), "All occultation observers should see at least one such grazing occultation, just for their dynamic beauty; observations of them are less valuable now with such precise data available from space missions for both the moon and stars." 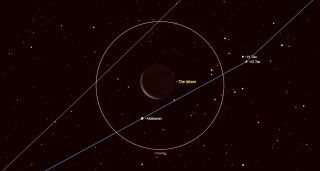 The southern-limit Aldebaran graze on July 10 will start at moonrise at Dows, Iowa, at 3:36 a.m. CDT. Multiple events where the star disappears and reappears along the lunar limb can last as long as 4 minutes centered on that time, depending on the location. 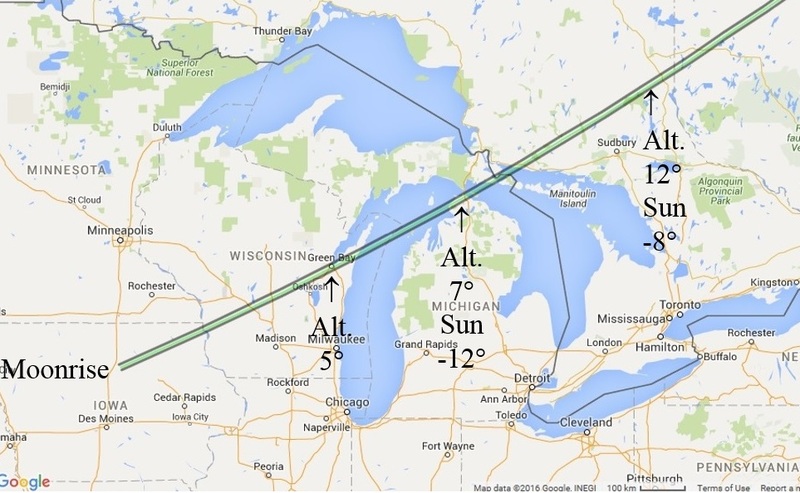 The path crosses the Mississippi River (altitude 2 degrees) at De Soto, Wisconsin, and then crosses that state, passing just north of Wisconsin Dells and Appleton, and right over Green Bay, where the moon altitude will be 5 degrees. Central graze will be at 4:37 a.m. EDT at Mackinaw City, Michigan, where the moon might be seen from shore locations 7 degrees above Lake Huron; there will be some twilight, with the sun 12 degrees below the horizon. 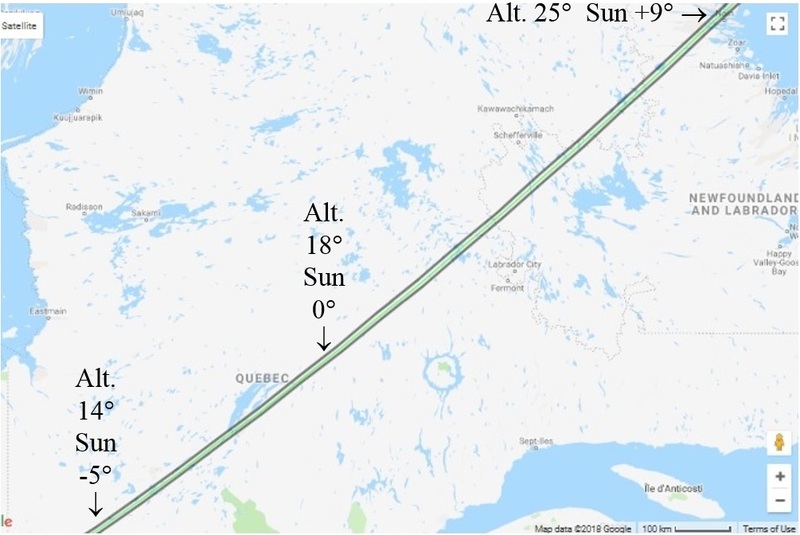 The path also passes over Earlton, Ontario, and then Amos, Quebec, at 4:40 a.m. EDT, where the moon's altitude will be 13 degrees and the sun will be 6 degrees below the horizon; that's the start of civil twilight, so the eastern sky will be quite bright. A map for the graze path covering the Midwest and Ontario can be found here. A map for the graze path covering Quebec and Labrador can be found here. 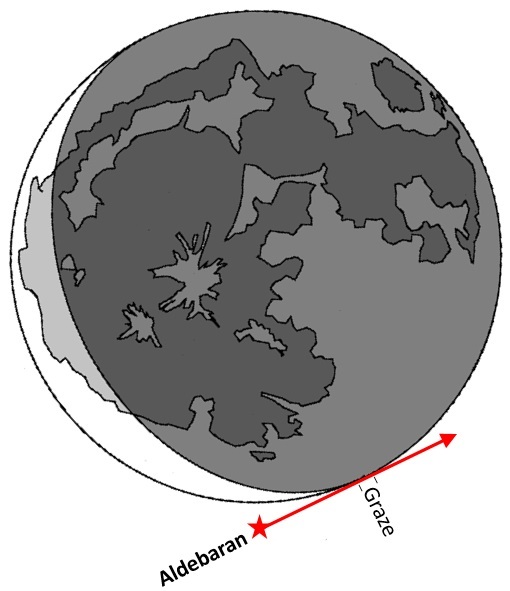 A view of how Aldebaran will appear to graze the moon's lower limb can be found here. Because the graze will occur at the moon's southern cusp, where there will be some sunlit lunar mountains — they will probably be fainter than the star — steadily held binoculars will give a better view. Finally, Dunham suggested that, to get some idea of what a bright grazing occultation is like, you watch a synchronized composite video that Andreas Gada produced of an expedition to Mississauga, Ontario, that he led for an Aldebaran graze on March 5, 2017. Gada plans another expedition for the July 10 graze to Earlton on Tuesday morning. If interested, you may contact him at andreas.gada@xplornet.com. Don't miss this near miss! For the rest of North America, this will be a very close approach of the moon to Aldebaran (called a conjunction). The moon, moving around the Earth in an easterly direction at roughly its own diameter each hour, will seem to creep slowly toward, and ultimately pass just above, the orange star. After its closest approach, the moon will move slowly away from Aldebaran, with a brightening dawn twilight arriving thereafter in eastern areas. Most of the United States and Canada will either be in darkness or twilight when the moon and star are closest together. Over the Western states, the minimum separation of Aldebaran from the moon's limb will be greater than 30 arc minutes (half a degree), so cities in that region were not included in the list. The table below provides the specific details for 16 selected cities. Calgary, Alberta 3:35 a.m. MDT (T) 11' 0.33 5:34 a.m.
Edmonton, Alberta 3:24 a.m. DT (T) 3' 0.09 5:18 a.m.
Chicago 3:34 a.m. CDT (T) 1' 0.03 5:25 a.m.
Columbus, Ohio 4:29 a.m. EDT (T) 3' 0.09 6:12 a.m.
Toronto 4:34 a.m. EDT (T) 1' 0.33 5:46 a.m.
Washington 4:24 a.m. EDT (T) 4' 0.12 5:52 a.m.
New York 4:29 a.m. EDT (T) 4' 0.12 5:34 a.m.
Montreal 4:34 a.m. EDT (T) 2' 0.06 5:16 a.m.
Boston 4:34 a.m. EDT (T) 4' 0.12 5:17 a.m.
Halifax, Nova Scotia 5:34 a.m. ADT (T) 5' 0.15 5:39 a.m. The above table gives civil times (all a.m.) of Aldebaran's closest approach to the edge of the moon's lower limb. (T) Indicates that closest approach occurs during morning twilight. Events without a (T) occur before the beginning of morning twilight in a completely dark sky, hence the time of local sunrise is omitted. Separation between Aldebaran and the moon's lower edge is given in minutes of arc (the apparent width of the moon on July 10 is 33.4 arc minutes) and the percentage of the apparent width of the moon. A value of 0.20, for example is equal to 20 percent of a moon's width (or fractionally, one-fifth). Examples: From Dallas, the closest approach between Aldebaran and the moon is at 4:07 a.m. CDT. Separation is 18 arc minutes, or 0.54, which is somewhat over one-half of a moon's width from Aldebaran to the lower edge of the moon. From New York, the closest approach is at 4:29 a.m. EDT, the separation is listed at 4 arc minutes, or 0.12, which means that 12 percent (or fractionally, slightly more than one-eighth) of the moon's width will separate Aldebaran from the moon's lower edge. This table was calculated exclusively for Space.com by Joe Rao. Space.com would like to thank Dunham for the details on the grazing occultation, as well as many of the links that were used to compile this column. Editor's note: If you capture an amazing image of the moon occultation of Aldebaran and would like to share it with Space.com for a story or gallery, send images and comments in to: spacephotos@space.com. Joe Rao serves an associate at New York's Hayden Planetarium. He writes about astronomy for Natural History magazine, the Farmer's Almanac and other publications, and he is also an on-camera meteorologist for FiOS1 News, Lower Hudson Valley, New York. Follow us @Spacedotcom, Facebook and Google+. Original article on Space.com.